The historical Afrin resistance still continues. Its strength triggered many incidents which can alter many accounts in the regions since its beginning on January 20th. It was obvious from the integrity of peoples with the vanguard of the resistance that an example like the Turkish army's taking Cerablus in one day or Hashdi Shabi's entering Kirkuk in one day would not have happened in Afrin. And after a two-months intense resistance, freedom forces led by YPG (People’s Protection Units – ed) withdrew from the city center of Afrin. Hundreds of thousands of civilians migrated in two days to Tel Rifat and Shahba region where they passed to the new phase of the resistance. With this manoeuvre, the lives of hundreds of thousands of civilians among which are the refugees from other war-torn parts of Syria are protected for now from the Turkish army's heavy shelling and air strikes. Before this colonialist attack, Afrin was a safe place which sheltered more than 300 thousand Syrian refugees. It was the land of the Rojava revolution where the institutions of peoples' self-administration were being built. Now, it is a land where jihadists from East Ghouta and Idlib are residing as settlers under the colonialist siege of fascist Turkish army. The looting of jihadists in Afrin has been in the media all over the world. Besides, the “Free” Syrian Army and Turkish army are torturing the very few civilians who stayed in the city, imposing Islam forcefully and trying annihilate their identities by executions and rapes. This is what would happen if the people of Afrin didn't withdraw: ethnic cleansing. With the price of its hundreds of martyr fighters and thousands of wounded, the Afrin resistance didn't give respite to the fascist invaders in spite of their firepower and soldier superiority. But getting close to its limits, in order both to sustain the resistance and to prevent a heavy destruction of the city, a tactical change was necessary. Although it seems like an immediate decision, it corresponds to the course of two-months of events. In a process which Russia opened the air space and gave the air strikes as a decisive factor, it will break this effect. International pressure's inability of stopping the Turkish state's massacres during these two months is the reason why this decision was not taken in the beginning. It is shown that the lands of revolution are not an easy catch by shouldering a bold price. It was always clear that Turkey has annexationist tendencies, yet it started the operation with the propaganda of protecting its borders. The colonialist fascist Turkish state wants to be permanently in Afrin and to use Idlib-Afrin-Cerablus line as a preparation field for its new invasions. It also aims to build a living space for the gangs it feeds. It has already deployed the deputy governor of Hatay to Afrin as its new governor and convened an alleged assembly of Afrin with some traitors from the Barzani-sided ENKS. It does not hide that the next target will be Manbij and rushes from pillar to post between Russia and USA. It fiercely attacks the meeting of France with the Kurdish delegation because of a possible new player in the field. It wants to liquidate the Kurdish national status completely by expanding its fascist aggression in North Kurdistan to Rojava and Başur. All in all, all these desires of Erdoğan's (Turkish President – ed) dictatorship are just vanity. Afrinians continue to participate in the resistance with its transformed type. Only in the last two weeks, as a result of actions of YPG in the city center and in the districts of Afrin, tens of Turkish army and FSA members got killed. 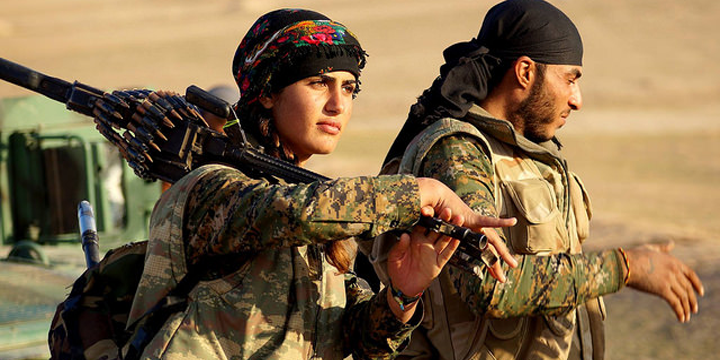 Transition from positional war to guerrilla warfare created a situation in which the resistance was prolonged and the Kurdish liberation movement receives fewer losses based on their 40 years of experience in this type of warfare. It is predictable that the continuation of this invasion which took Afrin in only two months will not be so easy. As the civilian massacres force Erdoğan to compromise in the international field, it inflamed the support of peoples internationally. Widespread actions all around the world once more showed the significance of the Kurdish resistance and Rojava revolution. While the people of Afrin stepped up as the vanguard force of the whole Kurdish people, it inspired determination and pertinacity to the antifascist forces of Turkey. People in Turkey did not hesitate to say no to the war despite of all the brutal violence. Democratic forces of Turkey and North Kurdistan shook off from the silence in this period. This was observed once more: the road to gain the political freedoms in Turkey passes through the political position saying no to the colonialist invasions in Kurdistan. The only way to barricade the Kurdish people's victories against the monstrous swallowing attacks of Erdoğan is spreading the flame of resistance to Turkey and North Kurdistan. It will not be only a move to save Afrin, but also a threshold which will break the fascist AKP-MHP bloc (Turkey’s ruling Justice and Development Party (AKP) and the Nationalist Movement Party (MHP) will be called the “People’s Alliance,” in the next round of Turksih elections – ed). As much as the resistance of Afrin meets with Amed and Istanbul, the struggle for freedom in Turkey will be accelerated. The antifascist struggle and political class warfare is integrated with the struggle against the colonialist invasion. In North Kurdistan, Kurdish people carry the consciousness that the national question cannot be solved through reforms anymore and believe in revolution. They wait for the vanguard forces to unleash the serhildan (a Kurdish word for the people's uprisings against the colonization of Kurdistan - ed). Communists fighting with this understanding both in the Kurdistan front and the Turkish front are advancing to organize the laboring left movement of Turkey for this struggle and to join them with the serhildan. And all the progressive, antifascist forces, internationalists have to play the role they must undertake. The crises of the Middle East are global as much as they are regional. This war, in which all the imperialists take part. will bring out revolutionary consequences for everyone. The condition of a worldwide anti-imperialist struggle also passes from the correct attitude of today's exam.